Over the past few years, voices calling for the removal of one of the West’s biggest reservoirs have gotten louder. And while proponents—including scientists, activists, journalists, and government officials—have cited everything from ecology to economics in their quest to decommission Glen Canyon Dam in northern Arizona and restore that part of the Colorado River, very little has been said about the impacts such an action would have on the house-of-cards-like network of compacts, agreements, and obligations comprising the “The Law of the River. Articles upon articles illustrate the environmental need for letting go of the Dam, lamenting at the natural wonders lost by the plugging up of the Colorado River. One of the biggest voices calling for the dismantling of the Dam is the former Bureau of Reclamation head Daniel Beard. Beard calls the dam a “deadbeat dam,” the title of his book calling for the dismantling of dams across America. Beard writes that instead of viewing the current drought conditions and the decreased levels of both Lake Mead and Lake Powell as a doom-and-gloom situation, that the Bureau of Reclamation and the politicians for each state should look at the situation as a chance for innovative thinking. As part of this strategy, Beard calls for the removal of Glen Canyon Dam and the draining of Lake Powell: let the Colorado River fill up Lake Mead instead bypassing the no longer useful Lake Powell. 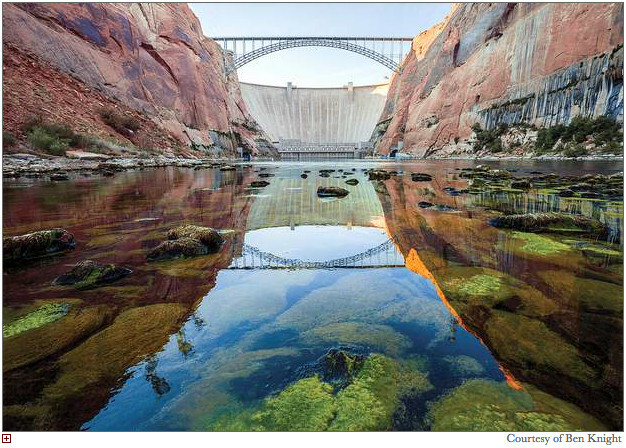 If decommissioning or dismantling the Glen Canyon Dam occurs and the waters of the Colorado River are allowed to flow freely downstream, questions about the use and ownership of the water will surface. For example, questions may arise regarding how much water is being allowed to freely flow from one basin to the next and if that amount constitutes an over delivery by the Upper Basin to the Lower Basin based on the Compact numbers. Without a barrier or a way to pump water upstream if too much is delivered downstream, the Upper Basin, without Glen Canyon Dam, opens itself up to many legal risks. Both basins would then need to work out an agreement or a system to replenish the Upper Basin with water. Potential solutions could include a pumping system to deliver water back upstream, a series of new dams, the sharing of the Lake Mead reservoir, and/or a new distribution point between the two basins. Since creating a pumping system could become troublesome and cost millions of dollars, coupled with the call to remove dams from streams and rivers, one likely solution is to share the lower reservoir, which would then change the distribution point as listed in the Compact. In order to accomplish this, stakeholders using the Colorado River would need to amend The Law of the River in some manner. This could include amending the Colorado River Compact of 1922, which has not been amended in nearly one hundred years.